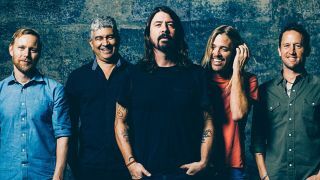 The Foo Fighters, Ghost and the Alamaba Shakes are among bands nominated in major categories at the 2016 Grammy Awards. They’re joined by Bob Dylan, Muse, the Rolling Stones and Roger Waters on the shortlist for the 58th annual event, which will take place in February. The Foos’ track Something From Nothing and the Alabama Shakes’ Don’t Wanna Fight are both among the Best Rock Performance nominees. Dave Grohl and co are also up for Best Music Film for Sonic Highways, against Roger Waters’ The Wall and movies about James Brown, Nina Simone and Amy Winehouse. Meanwhile, the Shakes also appear among the Best Rock Song for Don’t Wanna Fight, plus Album Of The Year and Best Alternative Music Album finalists for second record Sound & Color – giving them a total of four nominations. Ghost’s Cirice has secured them a place in the Best Metal Performance category alongside Slipknot’s Custer, Lamb Of God’s 512, Sevendust’s Thank You and August Burns Red’s Identity. Dylan’s Shadows In The Night is up for Best Traditional Pop Vocal Album and the Stones’ Sticky Fingers deluxe reissue could win Best Package. The Dead Weather are nominated for Best Music Video, while Waters’ re-released solo album Amused To Death is among the Best Surround Sound Album candidates. Grammys boss Neil Portnow says: “Diversity in the creative community is what makes music a universal language. It’s gratifying to see the vibrancy of today’s artistic landscape reflected in this year’s nominations. Winners will be announced during a gala event at the Staples Center, Los Angeles, on February 15. The full list of nominations is available via the Grammys website.